When Anne asked me so politely if I wanted to guest blog, I just couldn’t say no. So here is my contribution: Slow Cooked Beef Tenderloin. The Swedish name is “tjälknöl”, which roughly translated would be frost-bump. The reason for that name is that you start the cooking with frozen meat. I use beef tenderloin even if it’s more often used on elk steaks, roast beef and such "bigger" pieces of meat. Before the meat is ready in the oven, I prepare the marinade. How much you need depends on the size of bowl you will use later on, so for a large bowl, you need to double (or even triple) the basic marinade recipe. The marinade is made of 1 litre of water, 100 ml of salt, some ground pepper and 2-3 bay leaves. Place the cooked meat in enough marinade to have it covered and place it in the fridge. I keep the tender sirloin there for about 6 hours. If you use a shorter time the meat will not take enough flavour. On the other hand, if you let it stay too long, it will make the meat a bit too salty. If you should use the recipe on larger pieces of meat, more time will be needed. Over night could be necessary. When the meat has been in the marinade you wrap it in aluminium foil and keep it in the fridge until its time to eat it. This way of preparing the meat is very easy. Even if the time it needs to be in the oven and in the fridge is long, the actual time used for doing something with the food is very short. When I was preparing the food for our wedding, my wife and I had time go and get some coffee with Anne and Per, while the meat was in the oven. 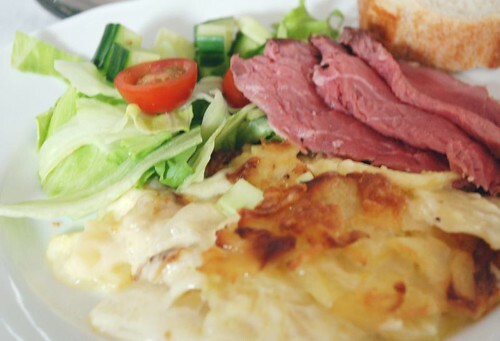 You can serve the meat with whatever you like, weather that is potato salad or potato gratin. It fits perfectly with almost anything! Oh, I haven't had tjälknöl in years. Must ask my folks to save me a piece of moose until I get home. Nice of you to visit. It would be wonderful if someone- the owner of the blog perhaps- would take responsibility for proofreading blogs (their own and "guest blogs") so they don't look as though they were written by someone with a fifth grade education. And wouldn't it be wonderful if people didn't leave anonymous comments complaining about petty things? Please do realize that English is not the first language for everyone in the world. If it bothers you that much, stick to books. Just doing this with a joint of beef. How long does it keep once it is out of the marinade?? Just to confirm - you cook the meat in the oven and THEN you put it in the marinade in the fridge for a long time? The end result is cold cooked meat?